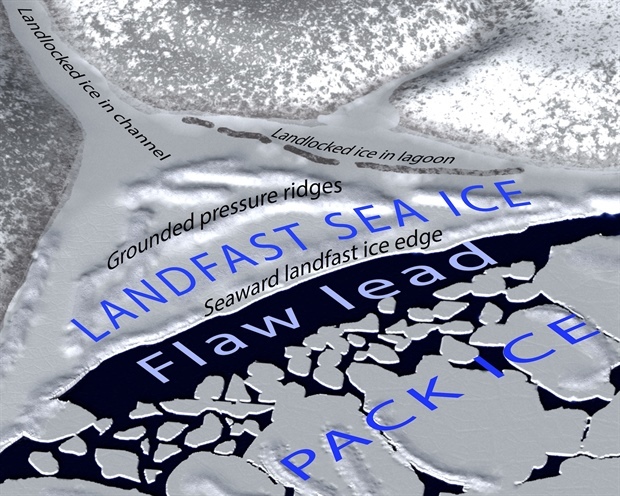 Landfast ice is an essential component of the coastal sea ice system. Acting as a floating extension of the land (Fig. 1), landfast ice is the most accessible form of sea ice and the one most often encountered by people. Members of Arctic coastal communities travel across landfast ice (Fig. 2) and hunt marine mammals and birds that are commonly found at its seaward edge (George et al., 2004; Laidre et al., 2015; Lovvorn et al., 2018). Ringed seals, in particular, are an important prey species for polar bears and subsistence hunters. These seals are uniquely adapted to maintain breathing holes in landfast ice (Smith and Hammill, 1981), which otherwise lacks the openings (e.g., cracks and leads) used by marine mammals in the drifting ice pack. Additionally, landfast ice serves as a platform for the oil and gas industry, which relies on ice roads across landfast ice to access nearshore production and exploration facilities (Potter et al., 1981; Masterson, 2009). Landfast ice also plays an important role in the sediment dynamics of coastal waters (Eicken et al., 2005a) and can buffer the coast against the erosive action of waves (Lantuit and Pollard, 2008). By isolating the underlying ocean from wind mixing, landfast ice allows river plumes to extend farther than they would under open water or pack ice (Ingram, 1987; Granskog et al., 2005; Kasper and Weingartner, 2015). In some cases, the hydrographic influence of landfast extends well beyond the coastal zone (Itkin et al., 2015), affecting the locations of upwelling in locations such as the Beaufort Sea (Pickart et al., 2009) and deep convection on the Eurasian Arctic shelf (Dmitrenko et al., 2005). Fig. 1. Landfast ice is distinguished from the drifting pack ice by its attachment to the land. A flaw lead of open water is sometimes present at the seaward edge of the landfast ice. When the pack ice pushes against the landfast ice edge, ice deformation often occurs and creates ridges within and along the boundary of the landfast ice. Fig. 2. 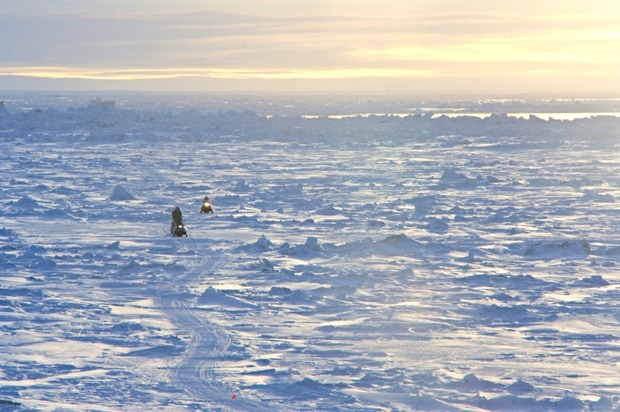 Two community members returning by snowmobile from a flaw lead at the seaward edge of the landfast ice near Utqiaġvik, Alaska. What distinguishes landfast ice from drifting pack ice and allows it to fulfill all its roles in the Earth system is its attachment to the coast and, hence, the immobility this provides. Depending on the coastal setting, there are two principal ways in which sea ice can become attached to the land (Fig. 1). In lagoons, fjords, channels, and other enclosed waters, sea ice can become landlocked, typically shortly after freeze-up is complete (Galley et al., 2012; Hata and Tremblay, 2015a, 2015b). Isolated from dynamic forces, the landlocked ice remains largely undeformed and level. In contrast, landfast ice along open coasts frequently interacts with drifting pack ice at its seaward edge. This interaction often leads to the creation of large pressure ridges, which form when ice converges and piles up both above and below the waterline. Sometimes known as stamukhi (Barnes et al., 1978), these ridges anchor the landfast ice in place when they become grounded on the seafloor (Mahoney et al., 2007; Jones et al., 2016). These ridges can become grounded either during their formation process or they may form offshore and drift into shallow water (Reimnitz et al., 1978; Mahoney et al., 2007; Jones et al., 2016). As a result of these processes, landfast ice formed along open coastlines invariably has a rough surface (Fig. 2). Also, in sufficiently shallow waters (typically ≲ 1.5 m), sea ice may freeze to the seafloor and become bottomfast (Reimnitz and Barnes, 1974; Dammann et al., 2018a). Landfast ice is found along coastlines wherever sea ice occurs. In the Arctic, it typically reaches an average annual maximum extent of 1.8 million km2 (Yu et al., 2013), or approximately 12% of the total Northern Hemisphere wintertime sea ice cover (Fig. 3). Over one third of landfast ice (660,000 km2) is found in the Kara, Laptev, and East Siberian seas (Yu et al., 2013), where it can extend up to 300 km from the Eurasian shore (Divine et al., 2004). The channels and straits of the Canadian Arctic Archipelago, which can be up to 160 km wide, account for almost another third of total Arctic landfast extent (540,000 km2) (Yu et al., 2013). The remaining third is spread more thinly along the coasts of the other Arctic and sub-Arctic seas, typically extending less than 50 km from the coast (e.g., Mahoney et al., 2014). The distribution of landfast ice extent in the Arctic can be largely explained by regional variations in the depth and slope of the inner continental shelf. Except in landlocked regions, the extent of landfast ice is largely limited by local bathymetry and the depth to which the keels of pressure ridges in the region extend below the water. As a result, despite the large differences in overall distance from shore, the seaward edge of landfast ice in most regions of the Arctic is usually found in 15-30 m of water (Granskog et al., 2006; Mahoney et al., 2014; Selyuzhenok et al., 2015). In some cases, grounded icebergs may allow landfast ice to extend into waters deeper than 100 m along the coasts of Greenland, northern Canada, Severnaya Zemlya, and Svalbard (Jacobs et al., 1975; Divine et al., 2004). Fig. 3. Minimum, median, and maximum Arctic landfast ice extent derived from NIC ice charts for the period 2008-18. Landfast ice is typically a seasonal phenomenon, forming each fall and breaking up the following spring. 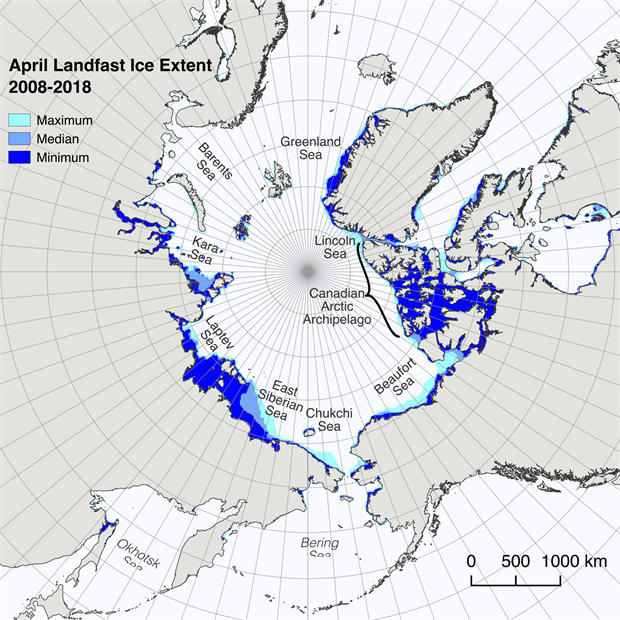 However, landfast ice persists through the summer melt season in a number of locations in the Canadian Arctic Archipelago (Alt et al., 2006; Galley et al., 2012; Pope et al., 2012) and is sometimes found in the Taymyr Peninsula region of Siberia (Reimnitz et al., 1995). The typical annual cycle begins in early winter with the first attachment of ice to the shoreline, which usually happens sometime after the first appearance of drifting sea ice in coastal waters. Landfast ice formation occurs earliest in sheltered locations such as the lagoons (Mahoney et al., 2014), shallow waters around deltas (Divine et al., 2004; Selyuzhenok et al., 2015), and the channels and sounds of the Canadian Arctic Archipelago (Galley et al., 2012). In such areas, the ice cover becomes landfast as the pack ice gradually loses mobility as it thickens and extends between shorelines (Selyuzhenok et al., 2017). By comparison, landfast ice along open coastlines largely forms through an accretionary process, whereby ice formed elsewhere is transported into the coastal region and becomes attached to the shoreline or seaward edge of existing landfast ice (Reimnitz et al., 1978; Mahoney et al., 2007). This process may be interrupted or reversed by breakout events (Mahoney et al., 2007; Jones et al., 2016; Selyuzhenok et al., 2017), but by the end of most winters the landfast ice on open coastlines will reach a maximum extent limited by local bathymetry, as described above. Break-up of landfast ice is the result of both dynamic and thermodynamic processes. In the most general case, the ice cover is weakened by warming and thinning until it is detached from the coast or other landfast ice by winds, currents, or waves. In landlocked areas, breakup is a predominantly thermodynamic process (Melling, 2002) and in the Canadian Arctic Archipelago this results in a relatively consistent break-up date each year (Galley et al., 2012). Similarly, if landfast ice on open coastlines is not heavily grounded, break-up date correlates well with the cumulative amount of solar energy reaching the Earth's surface (Petrich et al., 2012). However, if the landfast ice cover along these open coastal regions is more firmly anchored, the timing of breakup is more likely to be controlled by the occurrence of strong winds and currents or changes in local sea level (Divine et al., 2004; Mahoney et al., 2007; Jones et al., 2016). Near major rivers, the break-up of landfast ice can be triggered by spring discharge (Bareiss et al., 1999; Divine et al., 2003). The fate of landfast sea ice after break-up is not well understood, but fragments of former landfast ice may represent an important refuge for walrus and other ice-dependent pinnipeds, while also representing a potential hazard for coastal shipping. Due to its accessibility, the longest records of sea ice thickness anywhere in the Arctic come from measurements made in landfast ice, dating back to the 1930s in the Russian Arctic (Polyakov et al., 2003) and the 1950s in the Canadian Arctic Archipelago (Brown and Cote, 1992; Howell et al., 2016). Recent analyses suggest there has been a reduction in annual maximum ice thickness of around 25 cm (approximately 10%) at most locations in the Canadian Arctic Archipelago (Howell et al., 2016). Similarly, landfast ice at Hopen on the Barents Sea coast was found to be thinning by approximately 1 cm per year between 1966 and 2007 (Gerland et al., 2008). A 16-year record of landfast ice thickness near Utqiaġvik (Eicken et al., 2012) indicates the annual maximum ice thickness has decreased by around 30 cm since 2000 (Eicken et al., 2012). Weekly charts from the U.S. National Ice Service (NIC) indicate that overall landfast ice extent in the Arctic decreased by approximately 12,300 km2 yr-1 (0.7% yr-1) between 1976 and 2007 (Yu et al., 2013). It should be noted that the NIC results represent changes in the seasonal average extent from January to May, rather than the full maximum extent at the end of the growth season. In the Chukchi Sea, the annual maximum width of landfast ice reduced by an average of 13 km (~50%) between the periods 1973-76 (Stringer, 1978) and 1996-2008 (Mahoney et al., 2014), while the maximum extent of landfast ice in the Beaufort Sea changed little during this time. Also, charts from the Arctic and Antarctic Research Institute (AARI) in Russia show no consistent trend in maximum landfast ice extent in the Laptev Sea between 1999 and 2013 (Selyuzhenok et al., 2015). The declining seasonal average extent of Arctic landfast ice is in part caused by a later date of formation and earlier break-up. Over the period 1976-2007, NIC ice charts indicate that the duration of landfast ice is decreasing by approximately 0.8 d/yr on average across the Northern Hemisphere, with the fastest changes occurring mostly in the Russian Arctic (Yu et al., 2013). AARI ice charts show a declining trend in Laptev Sea landfast ice duration of almost 3 d/yr (Selyuzhenok et al., 2015) while Canadian Ice Service charts show similar trends in the Alaska Beaufort Sea and Mackenzie Delta area, and a shorter landfast ice season throughout the Canadian Arctic Archipelago (Galley et al., 2012). A comparison between results from studies covering the periods 1973-77 (Barry et al., 1979) and 1996-2008 shows a shortening of the landfast season of approximately 53 days (~2 d/yr) in the western Beaufort Sea and 38 days (~1.4 d/yr) in the Chukchi Sea (Mahoney et al., 2014). The reduced length of the landfast ice season is also likely a strong driver of the reduced end-of-winter thickness of landfast ice described above. Throughout the Arctic, landfast ice is shrinking in all dimensions, albeit with significant regional variability. Due to a later start to formation and an earlier break-up, it is occupying the coastline for a shorter period of time each year and it is not growing as thick as it used to. In some areas, its maximum winter extent is also decreasing. These changes are having direct impacts on residents of coastal communities. These communities are needing to adapt to increasingly unsafe and unpredictable ice conditions (Ford et al., 2008; Laidler et al., 2009; Druckenmiller et al., 2010), which exacerbate impacts from other climatic and socio-economic changes (Ford et al., 2009). Improved observations of landfast ice will allow communities to better identify vulnerabilities and develop adaption plans (Furgal and Seguin, 2006). Such observations are also expected to be of value to the operators of nearshore oil and gas platforms in the Arctic (Dammann et al., 2018c). Additionally, since it occupies the intersection between the terrestrial, marine, and atmospheric domains, improved observations of landfast ice will lead to a better understanding of how these systems interact in a changing Arctic. Recent developments in modeling of landfast ice have relied on observations of its seasonal development for validation (Lemieux et al., 2015; Olason, 2016). As a rapidly changing and interconnected component of the Arctic system directly impacting local residents, it would seem that landfast ice is well suited for inclusion as an 'Indicator' essay in the Arctic Report Card. However, we currently lack a clear understanding of changes in the last few years and an observing strategy to meet future needs. Such an observing strategy will need to be capable of measuring the extent and thickness of landfast ice and resolving its annual cycle. There is growing awareness of the value of community partnerships in Arctic science, and this is particularly true for landfast sea ice research. Not only does community-based monitoring offer a means of collecting high quality in situ observations of the thickness and annual cycle of coastal ice (Mahoney et al., 2009; Eicken et al., 2014), but co-production of knowledge (Behe and Daniel, 2018) at early stages of research design can help ensure a sound observing strategy that will generate information of value for all stakeholders. Satellite data also have a key role to play in monitoring landfast ice as an indicator of Arctic change. However, there is currently no standardized or automated approach for measuring landfast ice extent. Our longest continuous records come from satellite-derived operational ice charts, which were not intended to be long-term records of sea ice variability. With the recent and imminent launch of several new satellites, interferometric SAR (InSAR) currently holds great promise for automated classification and mapping of landfast ice (Meyer et al., 2011). Although computationally intensive, InSAR is able to detect small-scale ice motion and has proven capable of mapping bottomfast ice (Dammann et al., 2018a; Tibbles et al., 2018) and other zones of variable stability within the landfast ice cover (Dammann et al., 2018b). Bottomfast ice extent may be particularly valuable as an indicator of change due to its sensitivity to ice thickness and importance for underlying permafrost (Eicken et al., 2005b).